Duke University Press, 9780822349754, 262pp. Worlds Apart tells of a well-meaning foreign policy establishment often deaf to the voices of everyday people. 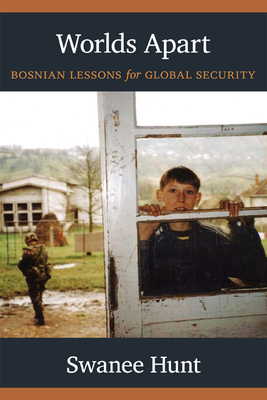 Its focus is the Bosnian War, but its implications extend to any situation that prompts the consideration of military intervention on humanitarian grounds. Ambassador Swanee Hunt served in Vienna during the Bosnian War and was intimately involved in American policy toward the Balkans. During her tenure as ambassador and after, she made scores of trips throughout Bosnia and the rest of the former Yugoslavia, attempting to understand the costly delays in foreign military intervention. To that end, she had hundreds of conversations with a wide range of politicians, refugees, journalists, farmers, clergy, aid workers, diplomats, soldiers, and others. In Worlds Apart, Hunt's eighty vignettes alternate between the people living out the war and "the internationals" deciding whether or how to intervene. From these stories, most of which she witnessed firsthand, she draws six lessons applicable to current conflicts throughout the world. These lessons cannot be learned from afar, Hunt says, with insiders and outsiders working apart. Only by bridging those worlds can we build a stronger paradigm of inclusive international security. Swanee Hunt chairs the Washington-based Institute for Inclusive Security. During her tenure as US ambassador to Austria (1993-97), she hosted negotiations and symposia focused on securing the peace in the neighboring Balkan states. She is a member of the US Council on Foreign Relations, the Eleanor Roosevelt Lecturer in Public Policy at Harvard University's John F. Kennedy School of Government, and the president of Hunt Alternatives Fund. She has appeared on CNN, MSNBC, and NPR, and she has written for Foreign Affairs, Foreign Policy, the International Herald Tribune, the Chicago Tribune, the Los Angeles Times, the Boston Globe, and the Huffington Post, among other publications. She is the author of Half-Life of a Zealot and This Was Not Our War: Bosnian Women Reclaiming the Peace, both also published by Duke University Press.